After a three-game losing streak to end non-conference play, the NKU women’s soccer team has now won three straight games. 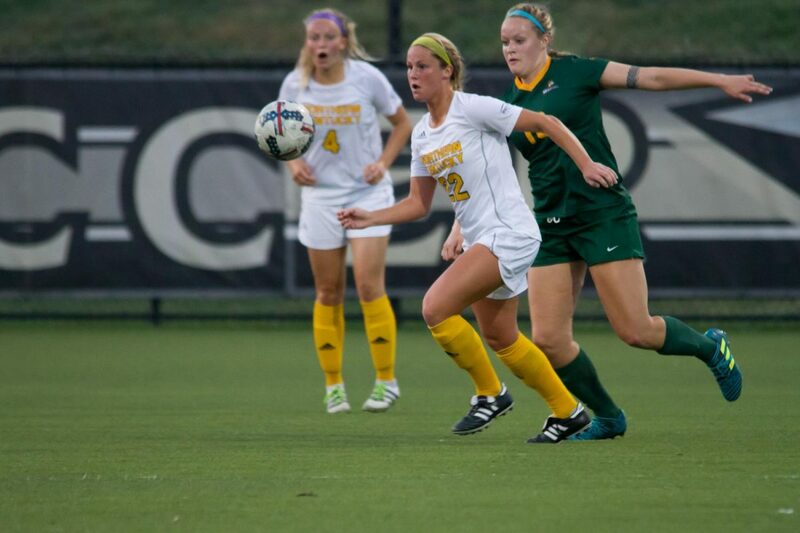 The Norse defeated the Wright State Raiders 1-0 at the NKU Soccer Stadium Wednesday night to move to 6-4 and 3-0 in Horizon League play. The Raiders drop their first Horizon League game of the year and fall to 7-5 overall. Jessica Frey came up with the game-winner in the 75 minute, when she was able to recover possession after falling down in the box. After getting back off the ground, Frey gathered herself, turned and put the ball past the diving Maddie Jewell to give NKU the 1-0 lead. The goal was Frey’s eighth of the season and her third game-winning goal of the season. It also tied her for the Horizon League lead in goals. Frey ended her night with eight shot attempts and two shots on goal. The Norse were able to maintain possession for the majority of the final 15 minutes to hold on for the victory. It was the second shutout of the season for Emily Lohmann and the Norse defense. Lohmann finished the night with three saves. Both teams had a number of opportunities to get on the board in the first half, including when the Norse were awarded a penalty kick after a handball in the box. Macy Hamblin’s kick was saved by the Wright State goalkeeper, keeping the match scoreless. Wright State had a golden opportunity of their own in the first half when Sarah Colvin was able to steal a ball at midfield and make a run. Her shot from just outside the box sailed over the goal, however. In the second half, the Norse had to hold off a flurry of Wright State attacks, including a stretch of play where Wright State took three corners kicks in about three minutes. Overall, the Norse were able to get off 17 shots against the Raiders, with four shots being placed on goal. Wright State took 10 shots total in the match and were only able to put three shots on goal. The Norse will look ahead to a two-game road trip that starts with Detroit Mercy on Saturday. NKU will then face Milwaukee, who is currently 9-0-1 on the season and were co-favorites to win the Horizon League this season. Frey believes having this victory tonight is a confidence booster for the Norse heading into the matchup with Milwaukee. “Going in with three wins is going to help give us that intensity that we need going into Detroit and Milwaukee,” Frey said.